Peter Jackson, the man most responsible for the great “Lord of the Rings” trilogy, is about to premier the first part of his “The Hobbit” in the U.S. These movies are, of course, based on the splendid books by J.R.R. Tolkien. In preparation for the Hobbit movie, my daughters and I are watching all nine hours or so of the extended edition of the Lord of the Rings. While watching the Fellowship of the Ring the other day, I was struck by something that Boromir says. 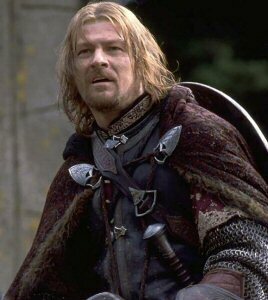 As you may recall, Boromir is from a country called Gondor. Many years ago, the King of Gondor left his people and did not return. Since then, they have been governed by a succession of men who’s title is “The Steward of Gondor.” The Steward’s job is to keep the throne open for the eventual return of the true King. The Steward is a lot like us. Our King, through his ascension, has gone back into Heaven. He tells us that he is coming again. In the meantime, we are left to watch after the Kingdom on his behalf. Of course, this parallel is very incomplete. We are not alone. Christ is present with us, we have the Holy Spirit, etc. But I hope you get the point. Boromir didn’t want a king because he had never known a good one. He had only known self-serving rulers. But as he got to know Aragorn he came to respect him, trust him, and even love him. Perhaps we are like Boromir. Perhaps we would rather take care of ourselves because we don’t know a better alternative. But what if there is a better alternative? What if Jesus Christ is a good and loving and merciful king? That could be a king worth following, even a king worth turning over charge of our life to. Advent is about waiting for the King. It is about saying “I have no king, but I need the King.” Today let me suggest turning to King Jesus, asking him to reveal himself. As we spend time with him, perhaps we too will get to know a good King whom we might trust with our lives.